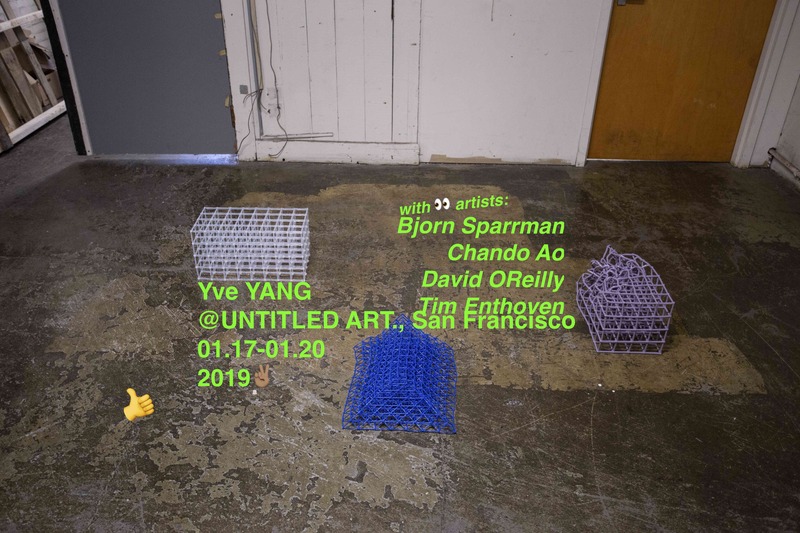 Yve YANG is pleased to announce our participation in UNTITLED Art San Francisco, 2019. We present four artists in this group show, including Bjorn Sparrman, Chando Ao, David OReilly, and Tim Enthoven. Bjørn Sparrman (b.1989, US) lives and works in Cambridge, Massachusetts. He received his BFA from Calvin College in 2012 and his Masters of Science in Art, Culture and Technology from Massachusetts Institute of Technology in 2016. He is currently Research Lead at the Self-Assembly Lab at MIT. As recipient of the ArtPrize 2014 Pitchnight grant, he exhibited his large public work, The Grand River Checkpoint Project, during the citywide festival in Grand Rapids, Michigan. David OReilly is an artist, film-maker and game designer whose distinctive style has made him one of the most respected and influential creative voices of the contemporary scene. Creator of the groundbreaking animated films Please Say Something and The External World, his work has won numerous awards and been the subject of several retrospectives internationally. He served as writer for the television shows Adventure Time & South Park, and created the fictional video games in Spike Jonze’s Academy Award-winning film Her. In 2014 he released his first game Mountain and in 2017 released his second game, Everything, which is a metaphysical tour de force that suggests entirely new directions for games as an art form. Chando Ao was born in Chongqing, China, 1990, and now Lives and works in New York and Shanghai. Education: Tufts University + School of Museum of Fine Arts, 2016. Recipient of The Chan Sculpture Award receiver, 2015. Dutch artist Tim Enthoven makes drawings, installations, situations, books, and video. His exhibitions include Language of Time at Annual Reportt in Copenhagen, The Form Of Form at the Lisbon Architecture Triennial, Partners at Abrons Art Center in New York and The Tiny Tim, the early years of Tim Enthoven at MU Artspace in Eindhoven. His work was published in The New York Times Magazine, Zeit Magazin and Le Monde amongst others. He got his BDes in communication-design from Design Academy Eindhoven and recently got received his MFA from Yale University. He currently lives and works in Amsterdam.